For 60 years, the Boulder Philharmonic has wowed audiences with astounding symphony performances. 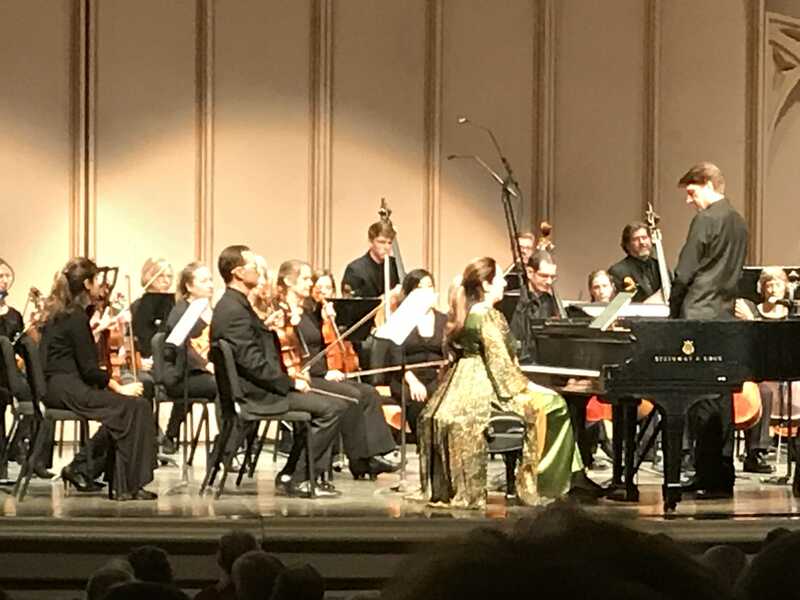 But Saturday night's concert at the University of Colorado's Macky Auditorium -- featuring world-class pianist Simone Dinnerstein -- just continued to drive the point home -- that the Boulder Philharmonic is much, much more than your local community band of musicians. They're a symphony of top-notch, talented professionals, easily clinching their hard-earned spot as one of the best professional orchestras in the state. [gallery type="rectangular" size="medium" ids="31173,31174,31175"] All it took to cement that in my mind was hearing their opening number, the Symphony in C major by C.P.E. Bach. Having ditched the percussion and wind instruments for this particular concert, the strings absolutely shone -- showing off impressive, fast-paced finger and bow work but still managing to stay completely in unison to sound like one smooth, voluminous instrument filling the concert hall. In addition to his charisma and obvious love for music, one of the things I appreciated about conductor Michael Butterman was the educational explanation he offered before each piece. Arnold Schoenberg's Verklärte Night especially benefited from that, since it was composed to be a musical interpretation of a dramatic poem by Richard Dehmel. Thanks to Butterman's breakdown of the piece beforehand, we were able to listen for specific themes and phrasing that, stanza by stanza, made the emotional poem come to life. Under Butterman's direction, the symphony played the colorful, layered Verklärte Night (translated "Transfigured Night") with so much passion that we could feel the angst hanging in the air, and then sense the moment when love overcame the angst and swallowed it whole. 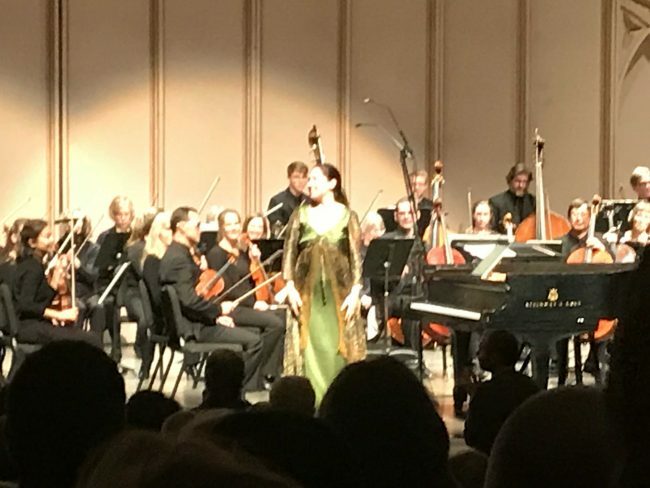 [gallery type="rectangular" size="medium" ids="31177,31178"] After intermission, a Steinway grand piano appeared front and center, and the Boulder Phil welcomed world-renowned pianist Simone Dinnerstein, who took the stage looking lovely in a flowy, olive-green, empire-waisted dress. Dinnerstein is particularly esteemed for her ability to perform J.S. Bach, and her collaboration with the Boulder Phil on the Keyboard Concerto No. 7 in G minor did not disappoint. In fact, the third movement may have been my favorite of the entire night. Her hands flew over the keys with ease and grace. During the pre-concert talk, they had explained that there are relatively few concertos written for piano with string orchestra accompaniment, so to experience the music of Bach performed by a pianist of Dinnerstein's caliber -- combined with the talents of the critically acclaimed Boulder Phil -- was indeed a true treat. The final number was the long-awaited Colorado premiere of Piano Concerto No. 3, by modern American composer Philip Glass. The history of the piece, as explained by Butterman and Dinnerstein, was that Glass had composed it specifically for Dinnerstein's playing style. "I think that the general aesthetic of it -- the type of lyricism, the type of mood, the colors that are possible -- I do think he had my playing in mind," Dinnerstein shared during the pre-concert talk. "At first I thought it was coincidental; I was very excited, and I said to him, 'This fits so well; I'm so happy.' And he said, 'Well, I wrote it for you.'" In fact, Glass and Bach's composition styles have several similarities, from their use of repetitive patterns to their relatively few dynamic markings, leaving a great deal open to the performers' interpretation (which Dinnerstein and the Boulder Phil excelled at!). The composers' actual melody styles, however, are vastly different. Piano Concerto No. 3 features a simple theme that incorporates unique, unexpected, unpredictable chord progressions that seem to become increasingly dark, ominous, and foreboding, the more the pattern repeats. Dinnerstein moved with the music, her eyes often closed, her adept fingers dramatically playing upon the theme and painting a picture that mesmerized the audience in its solemnity, with the orchestra joining in every few measures to add grand symphonic volume. The piece was long, and the audience marveled at Dinnerstein's strength and endurance, as well as the expression with which she continued to play throughout. [gallery type="rectangular" size="medium" ids="31183,31180,31179"] Of course, the Boulder audience (a packed house!) awarded the Boulder Phil/Dinnerstein collaboration with a standing ovation. The concert had been broadcast live on Colorado Public Radio, but there is really nothing comparable to being there in the concert hall in person. Not only does the Boulder Philharmonic have the ability to whisk one away to another world, but witnessing talent on that kind of scale is a privilege that only serves as inspiration for each of us to pursue excellence, perfection, and mastery in each of our own areas of expertise. The Boulder Philharmonic will next perform two concerts on Saturday, February 3, titled "Cirque Goes to the Movies," which will feature an aerial violinist with Cirque de la Symphonie, and music from Star Wars, Mission Impossible, Superman, Pirates of the Caribbean, and Titanic. Click here for ticket information. Hoping to see Hamilton in Denver this spring? Learn how to get tickets here.